There are many different ways alumni and friends make gifts to the College. 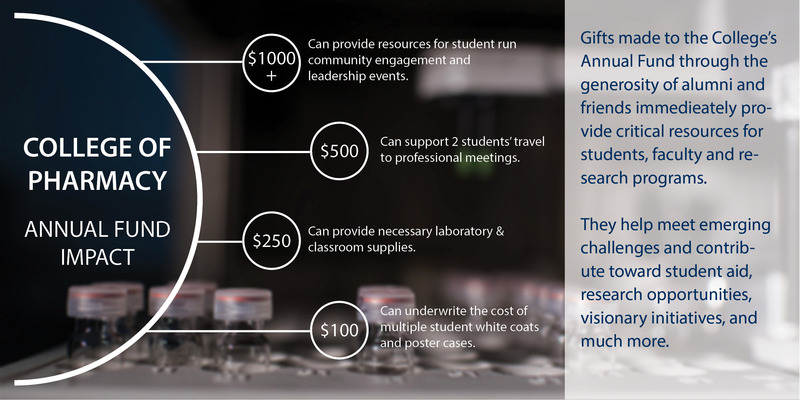 But none have greater day to day impact than gifts to the College's Annual Fund. While endowment funds help ensure long-term financial stability, the Annual Fund is the College's most important source of unrestricted dollars — dollars that are vital for scholarship support, student and faculty research projects, special programs, one-of-a-kind events, and many other services and programs that define a University of Michigan education. Securing additional endowed scholarship support for students is among the highest priorities of the College. The cost to educate our third- and fourth-year doctor of pharmacy students, including tuition and fees, books and supplies, and living expenses, is now approximately $37,000 per year for Michigan residents ($48,000 for third-year) and almost $53,000 per year for out-of-state students ($69,000 for fourth-year). Tuition and stipend for our graduate students currently exceeds $40,000 annually. Over sixty alumni and friends have created named endowments to provide scholarship assistance to PharmD candidates. A named scholarship requires $50,000 and we work with donors to create payment plans. Endowed graduate student fellowships, which provide partial to full tuition and stipend, may be established with gifts of $1,000,000 or more. We work with donors to create payment plans. Endowed faculty positions are vital to the College's ability to attract and retain world-renowned faculty for research and teaching and enable them to focus on the discovery of scientific solutions to problems in drug therapy and design. Endowed full professorships may be established with gifts of $2.5 million or more. We work with donors to create payment plans. The advancement of scientific knowledge through research plays an integral part in preparing students for careers in pharmacy. Indeed, students working closely with faculty of the College have an active role in developing new drugs, drug delivery systems, clinical drug therapy, and pharmacy and health care systems. To ensure that present and future scholars can continue the College's distinguished tradition of excellence in pharmaceutical research, the College seeks additional funds for research. Such funding will support novel research and preliminary investigations that hold the promise of new discoveries and will attract support from sources outside the University. The College seeks support for computers, printers, and software, especially those needed for student use and for the dispensing laboratory. The College seeks funds to advance Instructional Technology, including the development of computer-assisted learning modules for classroom and individual use, clinical skills development, research, and examination preparation. The College offers opportunities to support Seminar Programs for students and faculty, featuring prominent guest speakers to share information on recent research. Gifts starting at $25,000 are needed for this purpose.